Recently, I wrote about the Swarovski certificate of authenticity included with Swarovski Crystal figurines. After posting the article, I remembered that the limited edition Chinese Zodiac figurines do indeed include a unique Swarovski certificate of authenticity. All these Chinese Zodiacs have a fold-out card titled ‘The Chinese Zodiac’. The information is printed in both Chinese and English. This is not a Swarovski certificate of authenticity; it is a brochure that discusses the Chinese Zodiac astrology personalities. It is included with all Chinese Zodiac figurines. However, the limited edition Chinese Zodiac figurines also have a certificate of authenticity specific to the figurine. 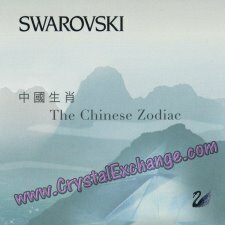 Since the limited edition Chinese Zodiacs were only available retail market in China, most Swarovski crystal fanatics wanting them were forced to turn to the online auctions or Swarovski secondary market dealers to secure the figurines for their collection. Crystal Exchange America presently has listings for the limited edition Zodiac Tiger and limited edition Zodiac Rabbit. No matter who the supplying source is, be sure that your limited edition Chinese Zodiac includes the Swarovski certificate of authenticity for maximum resale value.